Your graduation from the Institute will require some planning and action on your part. As you approach your senior year, we recommend you review the following procedures so that you are prepared to make this event as smooth as it is exciting. Visit the Academic Advising Office to get a graduation packet. This will include complete instructions, as well as the student information form and final planned schedule form. You may also download this from the Helpful Forms page. Complete an Online Application for Graduation (OAG). A new OAG is required for every semester that you apply to graduate. If you do not graduate when planned, you must fill out another OAG. The due dates for OAGs can be found on the GT Registrar's Calendar. If you are a Summer degree candidate, but you wish to participate in Spring commencement, please note there is an earlier deadline for the online application and an additional form is required. The graduation packet is due back to the Academic Advising office one week after the close of the Phase I Registration of your graduating semester. If you have any questions about your DegreeWorks audit, contact the AE associate chair or the AE academic advising manager. If you are asked to Select the Current Term, select the current semester from the dropdown box. Do not select your graduation term here. Press Continue. You will now be on the Curriculum Selection screen. If your major or minor are not correct, stop immediately. Your major and minor (if applicable) must be correctly declared before you can apply to graduate. Catalog Year: If you have decided to move to the new AE curriculum (2014-2015 catalog year), your catalog year must be changed accordingly. This can be done by filing out a change of major form. You can see which catalog year applies to your case by looking at your DegreeWorks audit. Minor: If your minor is not declared, is incorrect, or if you are no longer pursuing a minor, you must fill out a change of minor form. Select the radio button for the program from which you are graduating. Press Continue. NOTE: Students who have two majors can only select one major at a time. If you have 2 majors, you will need to complete this entire process for both. On the next screen, select the semester of graduation in the dropdown box. Press Continue. On the Diploma Name Selection screen, indicate whether you will use your current name or a different name for your diploma. Press Continue. NOTE: The registrar's office will review all requests to change names on diplomas. On the Diploma Mailing Address Selection screen, indicate the address to which you want us to send your diploma. Press Continue. 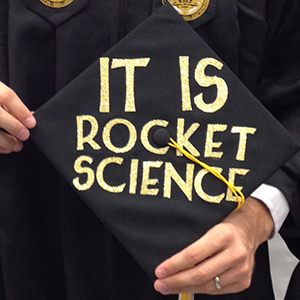 NOTE: Diplomas are mailed approximately 8 weeks after graduation, so plan accordingly. 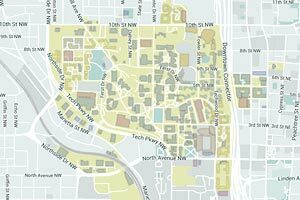 On the next screen, click on the Georgia Tech Exit Survey link at the bottom of the page. Complete and submit the survey. If you correctly submitted the OAG you will see it on that screen. If it says that no active graduation application exists then your application to graduate was not submitted. International Plan: All IP students who plan to complete the program must submit the International Plan Degree Designation Form to the GT Registrar's office separately. This form requires signature from both an IP advisor and the AE associate chair before you turn it into the GT Registrar's office. The International Plan is a degree designator and will appear on your diploma and transcript. To view your graduation status, log onto DegreeWorks. Near the top of your audit, under a section titled Student View, you will see a field for Graduation Information. The text that appears in that field is your current graduation application status. If you need to change your graduation term, send the Academic Advising Manager an e-mail asking that your OAG status be changed to inactive. This must be done before the drop day of the semester you petitioned to graduate. A new OAG must be submitted for the new semester in which you plan to graduate. Your last 36 credit-hours must be taken in residence at Georgia Tech. If you plan to take a class at another university within that 36-hour window, you must Petition the Faculty and receive a waiver of this rule prior to taking the class. Coursework more than 10 years old cannot be applied to a current BS degree. If you have coursework that is 10 years old, you must Petition the Faculty and receive permission for that coursework to apply. Summer degree candidates are invited to participate in the Fall semester commencement ceremony, which is held in December. To receive tickets to, and participate in, that ceremony, you must register an email address before August 1. Information will be sent to that email address during the Fall semester. If you need two or fewer classes to complete your degree requirements after the Spring semester, you may ask to participate in the Spring commencement ceremony. 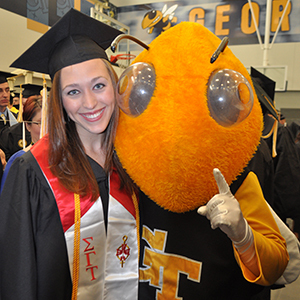 You will be required to apply for graduation during a special window in March and you must meet all of the requirements outlined by the GT Registrar.